We really take ownership of every transaction, and we take the fiduciary responsibility to protect our buyer’s interests very seriously. We have developed a detailed process for an aircraft purchase to make sure we have all of the bases covered. We have bought, sold, leased and managed many aircraft over the course of many years. This experience has defined and added to the system we have developed to ensure that we represent our client’s interests in the best possible way at every single step. Each step in this diagram is actually a complete process in itself. 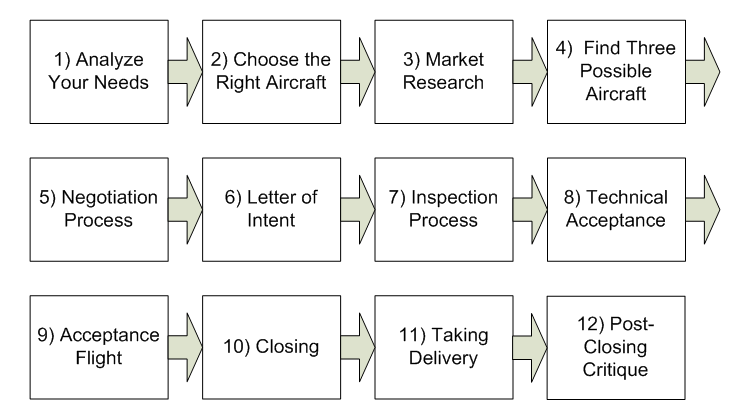 As an example, the Closing Process (Item 10) involves a 100-step checklist. When a person calls us, we start by taking the time to be sure we understand their needs. We take the time to understand your business and your travel needs to find the best solutions for you. This is the longest part of the process, and is outlined in detail in Finding the Right Aircraft is More About People Than Planes. This is the step in which the client is the most involved. Taking the time to ask the right questions, truly listen to the answers, and to thoroughly understand our clients’ needs is critical. Of course every client has different needs and priorities. For some, speed is the most important factor, others are willing to wait for an opportunity that will get a specific aircraft or better financial terms. We generally find three aircraft that meet the needs of our client. This puts us in a strong negotiating position because if our first choice doesn’t work out for any particular reason, we have already done the research and are prepared to begin negotiations on two others. The negotiation process can vary quite a bit depending on how sophisticated and motivated the seller is. Whatever the case may be, it is to the buyer’s advantage to have an experienced, skillful representative representing your interests. We provide the Letter of Intent (LOI) as a conclusion to successful negotiations. We ensure that all terms are clear and favorable, and recommend attorneys when needed to avoid issues. We monitor the pre-buy inspection on site. Since we are type-rated pilots in most of the aircraft we buy and sell, we can really understand the issues reported. When we have technical acceptance and our client has opened an escrow account prior to moving to a pre-purchase facility, we make sure the title searches are clear. We ensure that security interests on the aircraft are released, and all the documents are in order. Next, we do a pre-delivery acceptance flight. We are onboard the aircraft for every flight in the sales process. We employ a 100-point closing checklist to ensure that no detail escapes our attention. Examples of the details that we track to conclusion include ensuring that records are complete and correct, titles are clear, and liens are released. We’re on site for delivery. We get the delivery receipts signed and other documentation needed. We verify proof the delivery was accepted at the correct location; and we ensure that all the paperwork details are in order, such as ensuring that the Application for Registration pink copies are on the airplane. We do a post-closing critique, and put all of the documentation together in a complete file for the client’s transaction that is ready to keep in a safe place. We take ownership of every transaction, and the fiduciary responsibility to protect our buyer’s interests. Our company’s goal is to build relationships that last for a lifetime. We’re market specialists, in the relationship business. Our objective is to provide a flawless experience so that you call us each time you have a need to buy, sell, lease or manage an aircraft. 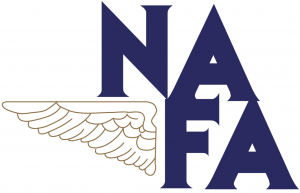 I just returned from Fort Lauderdale, Florida, where DJI attended the annual National Aircraft Finance Association (NAFA) meeting and conference. Here’s what I observed this year. As one might expect, the core attendance of this conference includes most of the major players in the aircraft finance arena. Banks, capital companies, private equity firms, and finance brokers were all in strong attendance. Some people asked me why an aircraft broker/dealer would go to a finance conference. The answer is that the two specialties are highly reliant upon each other. The availability and adaptability of aircraft lending makes such a significant impact on the transactions of which I am a part. Part of the value that DJI adds to the transaction process for our clients that we understand the options and the constraints of the aircraft finance space, so we found this conference highly valuable to our organization and our clients. Appetite to Lend Money: Despite the fact that most of DJI’s transactions have had buyers who were paying cash, it was very evident to me that most of the aircraft lenders out there are looking for more business and looking to grow their portfolios. This is good news for all involved in aviation. As the supply of financing makes a comeback, aircraft prices will stabilize, and in certain markets, show signs of gradual increase. Wide Scope of Lending Solutions: While some lenders might suggest that they have a financing solution for almost everyone, one of the big themes of the conference was that, while no single lender can appeal to all aircraft buyers, there is enough variation between the focal points of the various lenders, that almost any reasonable financing need can be met. In other words, whether your next planned transaction is a $50 million large cabin aircraft, or a $2 million turbo-prop finance lease, there are professionals in the lending space who focus on that area of aircraft finance and who want to earn your business, assuming that you are credit-worthy. The one exception is that most lenders are still shying away from aircraft older than 25 years. “Skin in the game” is essentially mandatory in this credit market. In other words, most loan structures that lenders are comfortable with are going to require the borrower to advance 15% to 30% of the transaction value, and in some unique cases, 50%. Keep in mind that back in 2007, some lenders were advancing 110% of the transaction value so that buyers could take the excess advance and apply it to aircraft improvements! 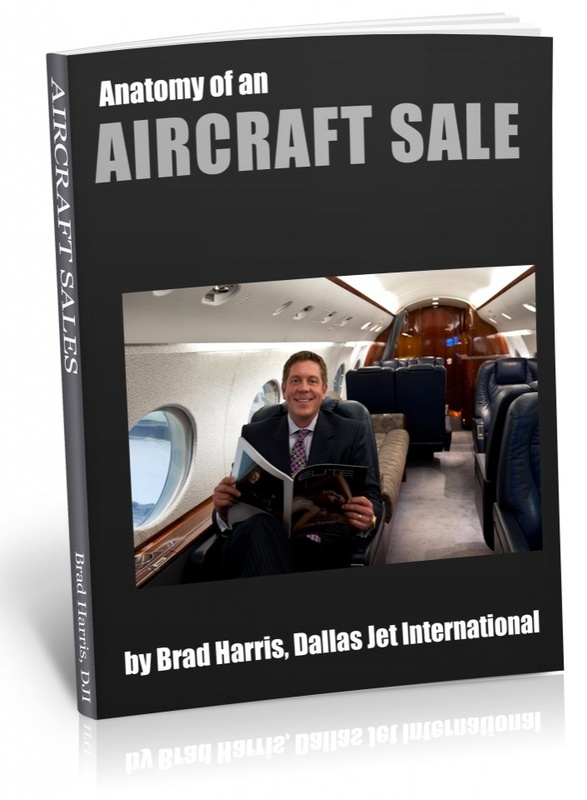 International Market: Most of the lenders are focused on the international marketplace and are vocal about the fact that the international marketplace is where much of the growth is going to happen in the business aircraft segment. Here in the US, this is important to the sellers, as many of the future buyers on DJI’s US listings are going to be from another country, and many of them are going to need financing to make the deal happen. Brazil, China, India, and Russia are all showing signs of significant growth in their appetites for business aircraft. Overall, the conference was an excellent event, and one which left the DJI team cautiously optimistic. If any of you out there have questions about financing as it relates to the purchase or sale of a business aircraft, please do not hesitate to call me. I would enjoy the opportunity to chat with you. You are currently browsing the Aircraft Sales Insights blog archives for May, 2011.